You don't have to live at the beach to bring a touch of the beach to your home. 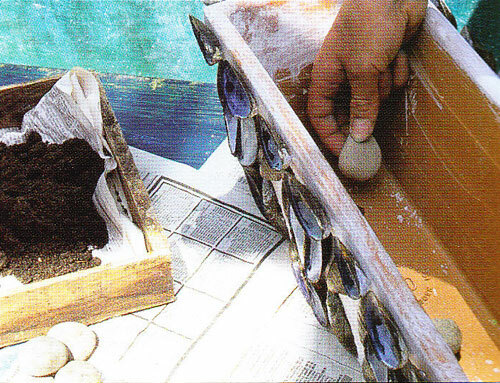 Here is a DIY tutorial on how to make a window box planter that is covered in seashells. Decorated window boxes provide a delightful finish to windows, almost bringing the garden into your house. Being flat-fronted, they are also easier to decorate than round pots. 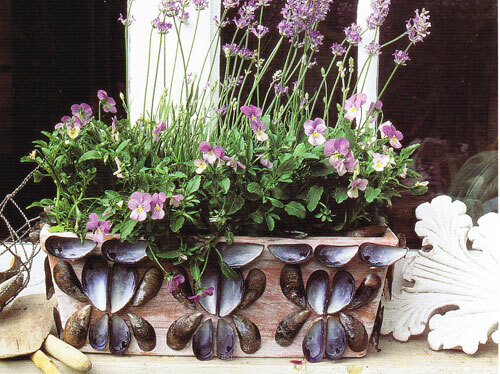 Here mussel shells lend impact to a coordinated planting of lavender and violas. Experiment with different shapes, using some mussel shells face up and others face down. Start out by laying your pattern out on a table so you can get an idea of how to proceed before gluing them on the planter. 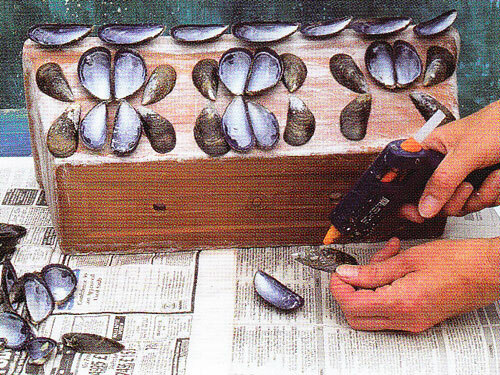 When finished, glue the shells on the side of the window box planter. Crocks or pebbles over the drain holes inside the window box. Fill the planter with compost, adding plant food as you go. Place the lavenders at the back of the box. Press extra compost in front of them till it is the right height for the violas. Plant the violas next. Press more compost firmly around all the plants and water the window box container generously. Place the planter in an area that gets partial sunlight, keep the soil moist but not wet and enjoy your own DIY Window Box Planter. Read More.....Create a Tower of Herbs. Read More.....Fairy Gardens are Fun. If you don't have a few indoor potted plants than you are missing out. They not only add color & beauty but they can also increase oxygen levels in your home and remove harmful chemicals found in cleaning products, carpets & faux woods. Below we want to list some of our favorites that are pretty easy to grow and become welcome additions to every home no matter what style or size. 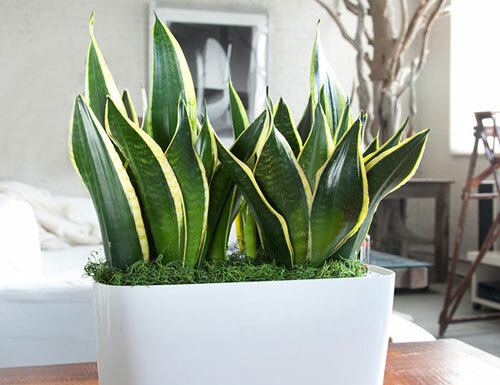 Snake Plants - You will see these potted two tone plants in many homes. Their variegated leaves grow upright and can have yellow or white edges. They love most lighting conditions so place the planter by a window or an indoor darker corner. Since the soil can stay dry most of the time they don't take a lot of care. Cactus - Heck who can kill a cactus right? Potted they can give a minimilistic touch to a interior decor. Just make sure they have a drain hole in the pot and the right type of potting soil. You want to water the roots by giving them a drink when the top soil is dry. Don't water the cactus directly. 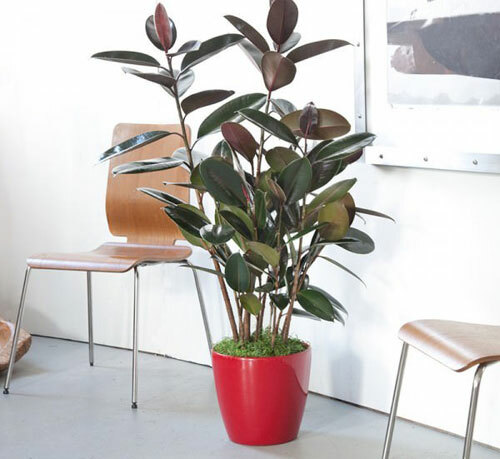 Rubber Tree - You see these a lot potted indoors. 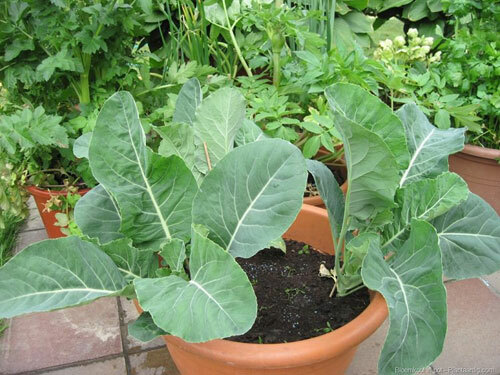 The leaves are beautiful oblong shape and have a great texture to them. They grow large so make sure the planter has a lot of room for them to grow and you don't need to repot every season. They like indirect sunlight and slightly dry soil. Fiji Palm - The dwarf version of the tropical pal adds a cool tropical feel. Plant in a white pot to contract with the dark green palm leaves that look like fans. This plant likes warm temperatures, and most are shade tolerant. English Ivy - We love the trailing greenery of this potted indoor plant. It's the most air purifying indoor plant. 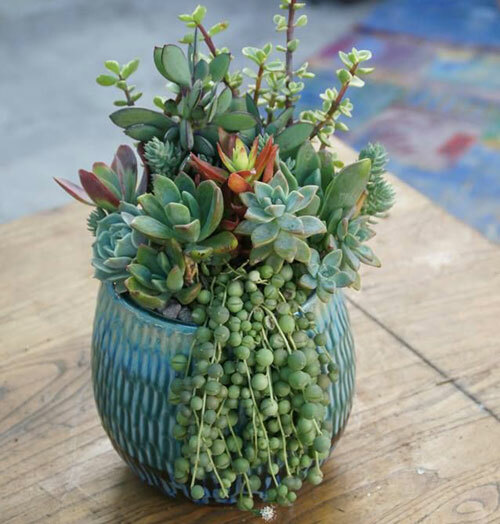 It makes great hostess gifts when potted in a decorative planter. It's really easy to care for and loves cooler temps and most soil. 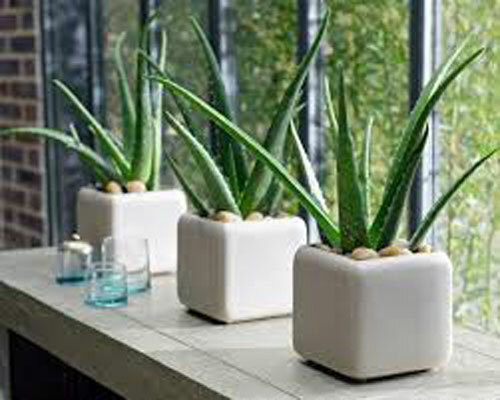 Lastly is Aloe Vera - Everyone has or should have one of these potted plants around the house. You are all aware of the medicinal properties of these plants. When it comes to a burn there is nothing better. Just pinch off a piece and rub it on the burn to start the healing process. Have you ever purchased a beautiful potted succulent at the neighborhood garden center then take it home and kill it before you can even get it transplanted? Well we have. 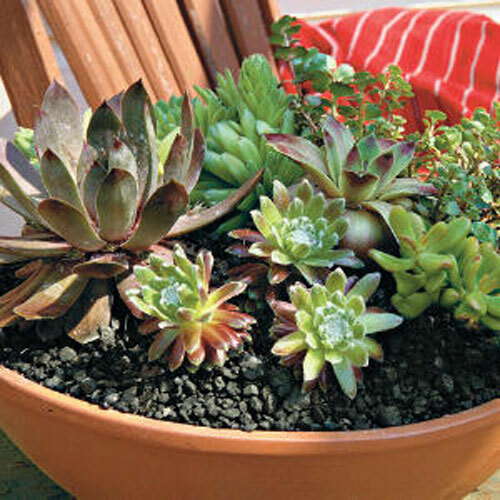 Watering succulents can be the trickiest part of growing and maintaining them. Everyone struggles with this issue even the most educated gardener. So, here are a few tips to help you master your own issues. 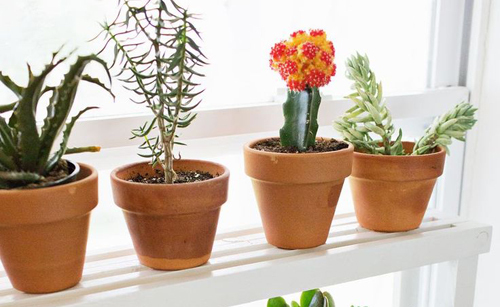 And, the next time you visit your garden center looking for a new potted succulent you will know that you now have the tips to keep your plants happy. Let's start with a few obvious issues. Always use a garden container with drain holes. Succulents don't like sitting in standing water. Next make sure you have well draining soil. Succulents don't like to sit in wet soil for very long. Having well draining soil in your planter with a drain hole is critical. Don't use a spray bottle when watering. Succulents like to be soaked not sprayed. Water in between your plants then on top of them. 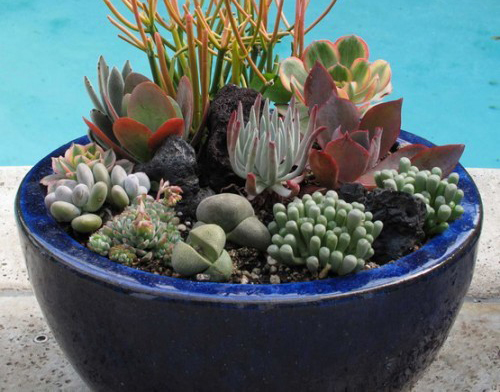 When you soak the soil only, this tell the succulents to drink up because a drought is coming. Once you water don't do it again until the soil is completely dry. This takes a few days. As a general rule if you are using the correct soil mix is to water every 4 days or so. If you live in a arid climate like Arizona, then you will water more often than a humid climate like Oregon. Just look at the roots and see if they are too wet they will rot and die. If too dry they will stop growing. 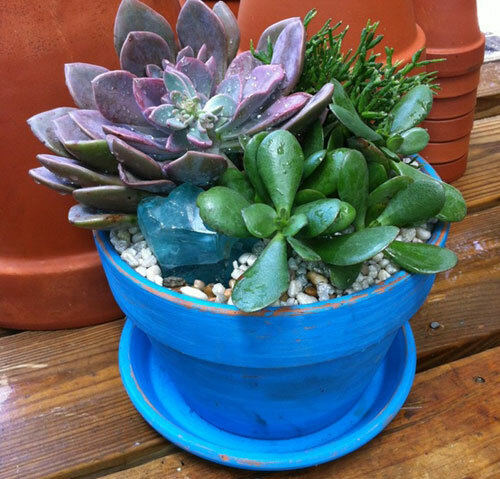 Hopefully you know have some great tips to help when growing and maintaining your potted succulents. Just keep your eyes on the way the plants look and try your best to make the right adjustments. It may not always work but you are on your way to having a better chance of success. Read more.....Tips for creating a fairy garden. 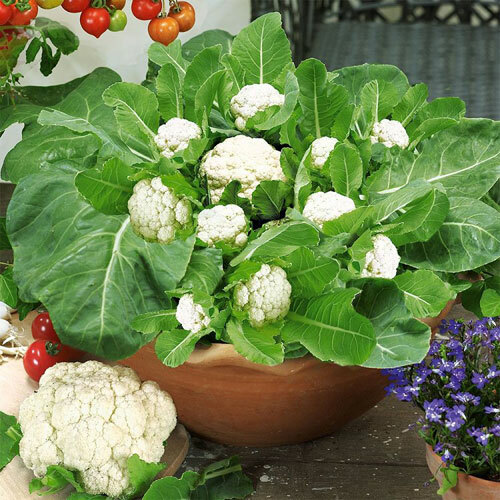 Growing cauliflower in garden containers is not that hard to do. Here are a few helpful tips to make sure that you have great success. Just follow the tips on proper requirements and ideal growing conditions. Cauliflower is a cool season crop but there are many hybrid cultivars available for both temperate and tropical weather, which means it can be grown diversely in a variety of climates. It's most important to plant the variety that fits the season and climate you are living in. General in warmer regions you can start to sow cauliflower seeds in fall and continue to sow the seeds till the end of winter. In a cooler zone it's better to sow the seeds late winter and up to spring to get summer or fall harvest. When choosing a container, choose one that is 12" deep and at least 10 inches wide to allow for enough room that the plant can grow. Make sure the pot has drain holes. You can grow one plant versus pot. If you go with a much larger container you can grow 2 to 3 plants. Place the pot in a sunny spot that receives at least 5 hrs of sunlight. Make sure you use quality potting soil that is light, deep and humus rich. Cauliflower like moist soil that drains well. Water regularly and don't let the soil dry out. When the head becomes 2 to 3 inches in diameter cover it with the inner leaves by breaking over the head. Fertilize with a heavy feeder. Last tips to remember - Cauliflower heads become ready for harvest in 3 to 4 months. It like moderate temps, and the right watering. Read More.....Ornamental Grasses in Garden Planters. Read More.....Grow Spinach in a Flower Pot. With a lot of folks looking to go eco-friendly around the house we are starting to see more wanting to grow their own food in garden containers. They don't like the selection at the store or the thought of feeding their family with produce that has been sprayed with pesticides. So, if you are thinking about possibly growing your own food on a small level and want the easiest way that uses less space then try potting up some veggies. When it comes to selecting a garden container most types will do. The main thing to look for are drain holes. Most veggie don't like their roots sitting in standing water so make sure that if the pots you select don't have holes - you drill them. We like terracotta because the clay is meant to breathe which is super healthy for all roots systems. The water will soak into the sides of the pots and help retain the moisture. Glazed, Poly Resin, Concrete, will all work well. Make sure they are large enough for the vegetables to grow with room to expand. 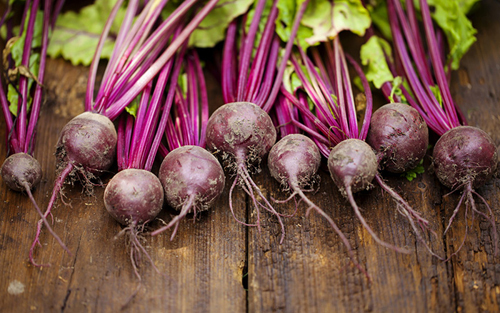 > Beetroot: These are great container crops. Sow a few seeds in the pot every couple of weeks and you'll be harvesting all summer. > Radish - They are trouble free and ready to harvest in as little as a month. > Potatoes - They don't need lots of room to grow just deep soil. > Chard - The color makes this an attractive crop also. Thin out seedlings. 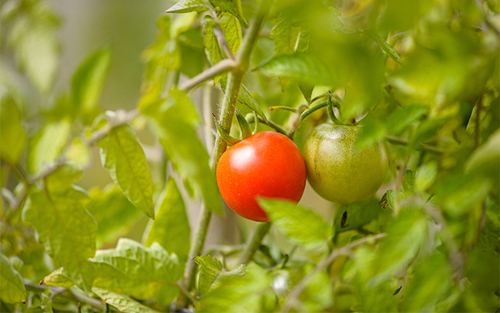 > Tomatoes - Keep evenly watered to prevent the fruit from splitting. Feed with fertilizer. 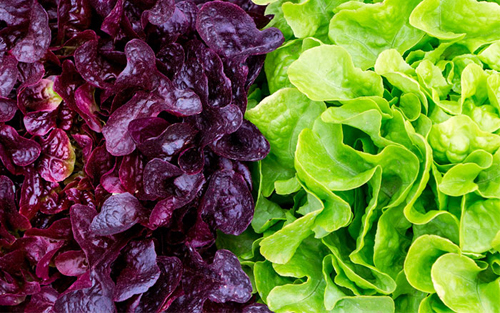 > Salad Leaves - The ultimate container crop. Sow a variety and grow as long as you keep harvesting the leaves. How easy is that? > Carrots - Like potatoes they just need deep soil to grow well. > Chilies - Perfect for a windowsill, the warmer the conditions the spicier. > Lettuce - Perfect for potting. Sow one or two at intervals so they don't all mature at the same time. > Salad Onions - Great for containers because they don't need deep soil and are easy to grow. > Spinach - Great to keep cutting and regrowing in pottery. 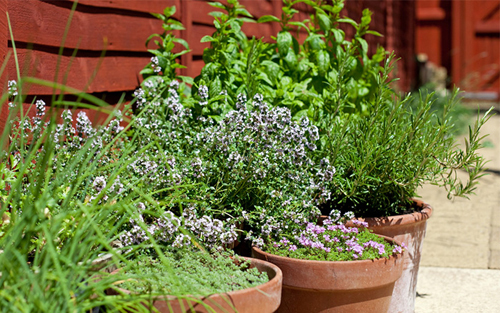 > Garden Herbs - We are all familiar with potted herbs. So Easy & fun to do. It's getting a bit chilly outside now so it's time to consider moving your herbs indoors.Vertical gardens are the rage right now especially where space is limited like in an apartment or small home. 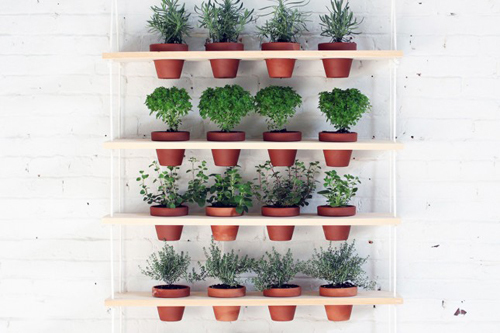 Here is a easy way to bring those potted herbs indoors, display they beautifully and still have space to spare. Because this vertical garden holds all kinds of terracotta pots and hangs it's perfect for a blank kitchen wall or area. Do you need a divider wall between your living space and your kitchen area. Want to add some potted green to a covered patio area where it's all white or beige, this works perfectly. Of course the dimensions are easy to adjust if you want a smaller vertical hanging garden or if you choose to use smaller or larger planters. 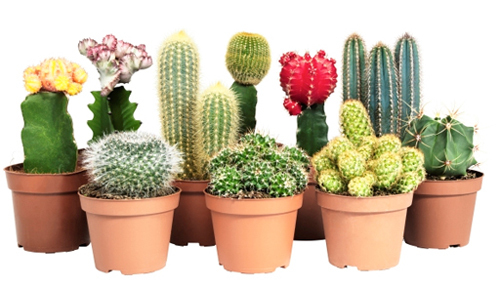 You can adjust from potted herbs to a planted succulent garden or a potted cactus display. The point it if you like this look, love to indoor garden and think you would like to try your own vertical garden then give it a go and tell us how you did. Good Luck!